Unified Number (UID No.) is a mandatory item to be filled in the application for UAE Emirates ID. Emirates ID system was launched in 2010 by Federal council of United Arab Emirates to maintain population system of UAE. 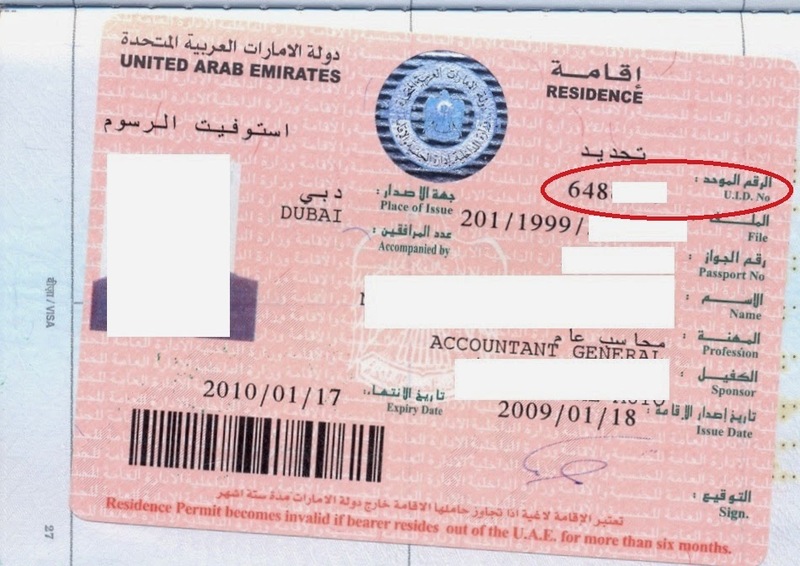 Without unified number an application for Emirates ID is incomplete and you must present the sufficient documents such as residence sticker or proof of UID No. You will not have a UID No. in your hand if you have just entered UAE through a residence visa and your residence visa is not stamped yet. What is the procedure to get Unified No. (UID No.) for applying Emirates ID if you only have residence entry permit issued and visa is not stamped in passport yet? You can visit nearest GDRFA branch along with your original passport plus the entry permit to be able to obtain your Unified ID number. Normally typing centers in UAE are entering 999999 in the space of UID No. and later when the residence sticker is requested by Emirates ID department the customer has to again visit the typing center with original passport and scan the stamped residence visa which has the Unified id number within 5 working days and resubmit the application through typing centre.